KHS GmbH has implemented an additional can filler machine size with greater capacity called Innofill Can C.
According to the company, Innofill Can C gives operators the technological innovations of the big machines and is convincing with its compact design and quick installation. With the Innofill Can C can filler KHS satisfies the demand of smaller breweries on the international market. Since introducing the prototype at drinktec 2017 there has been increased interest in the new technology from the Dortmund systems supplier. This is one of the reasons why KHS is launching a further machine size with a greater capacity to market this year. At the world premiere of the Innofill Can C at drinktec 2017 Canadian craft brewery Steamworks procured the very first machine with a serial number of 001. In commissioning the can filler in February 2018 the Dortmund systems provider laid the foundations for the future machine series. “The high order entry demonstrates that this machine concept is already proving convincing,” said Kevin Rathbun, project manager at KHS USA. The machine manufacturer has already sold a number of the new can fillers worldwide. KHS shipped the can filler in a single container to the customer in Vancouver where it was commissioned on site on a plug-and-produce basis without any need for complicated installation processes. As the 21 filling and three seaming stations, valve manifold, cladding and control cabinet on the Innofill Can C form an enclosed, ready-to-produce machine unit, all that had to be done during installation was to connect up the electricity cables, piping and conveyors. Just 14 days lay between delivery and the commissioning of the prototype. According to Steamworks its new plant engineering fills approximately 15,000 cans an hour in its standard 355-millilitre can format. The craft brewery also uses cans holding 473 and 500 millilitres. “With its new development KHS has again made the technical innovations of its big machines available to the craft brewing segment,” said Rathbun. In addition to the compact layout and fast installation, Gershkovitch also appreciates the machine’s hygienic design. In particular, this includes a gapless bell guide with PTFE expansion joints (Teflon) and bells which are lifted and positioned fully electropneumatically to seal the cans – without any mechanical action from cams and rollers. This does away with the need for water lubrication, simplifies cleaning and promises a service life which is up to twice as long as before. The Innofill Can C is designed for low to medium outputs depending on the can size. 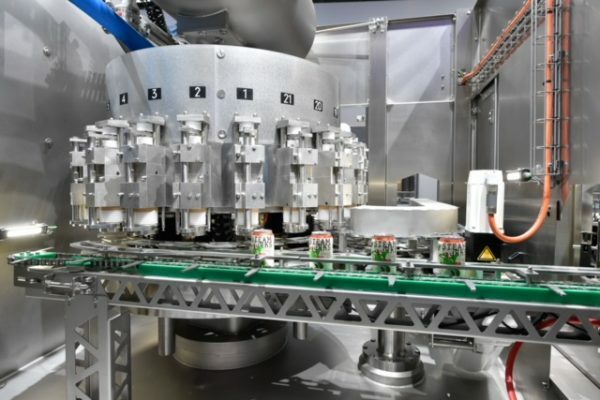 KHS is to initially implement a further machine size this year in order to increase the capacity for filling 330-millilitre cans from 15,600 to 27,800 cans per hour. “In addition to craft brewers, who continue to grow and grow, medium-sized breweries are also increasingly asking for further cost-efficient machines for the medium capacity range,” emphasised Rathbun. According to specifications the can filler can also process carbonated soft drinks or CSDs. “The output is then slightly higher”, Rathbun stated.